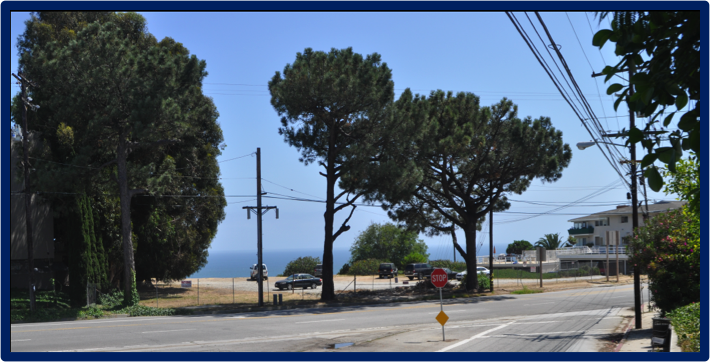 Proposed 16990-17000 Sunset Project | PROTECT PALISADES BLUFFS! To view the relevant Coastal Act Regional Interpretive Guidelines, please click here. Second, third, fourth and fifth stories of rear of building do not have required 10 foot setback from first floor as required by Q Overlay. To view the plans for 17000 Sunset, please click here. Please click here to view detailed analysis of geology and hydrology issues. Site was old arroyo that was filled to build Sunset and current site pad (see photo). 44,500 cu. yds. of fill and dirt must be excavated and hauled away. Malibu Village is at risk since it is directly below site and sits on fill placed over an ancient landslide. Site is natural drainage channel for Marquez Knolls neighborhood – Storm water drainage has NOT been studied. Hydrology and its effect on geology has not been studied to the depth of proposed construction or during a period of heavy rain. Please click here to view an independent geology report critical of project. Please click here to view another independent geology report. Site is on dangerous stretch of Sunset and location of many serious accidents. Cars and motorcycles routinely exceed posted speeds on this stretch of Sunset. Driveway does not align with light at Marquez even though this alignment would reduce the risk of accidents caused by dangerous left turns in and out of the project’s driveway. Inadequate representation of the project for the community – context renderings were promised, but not produced. Excavation and hauling of massive amounts of undocumented fill will affect surrounding neighborhoods – haul route not yet determined. Rare Torrey Pine trees will be removed. Presence of hydrogen sulfide gas not adequately studied. Construction worker parking will burden Marquez neighborhood for years. EIR required as matter of law.